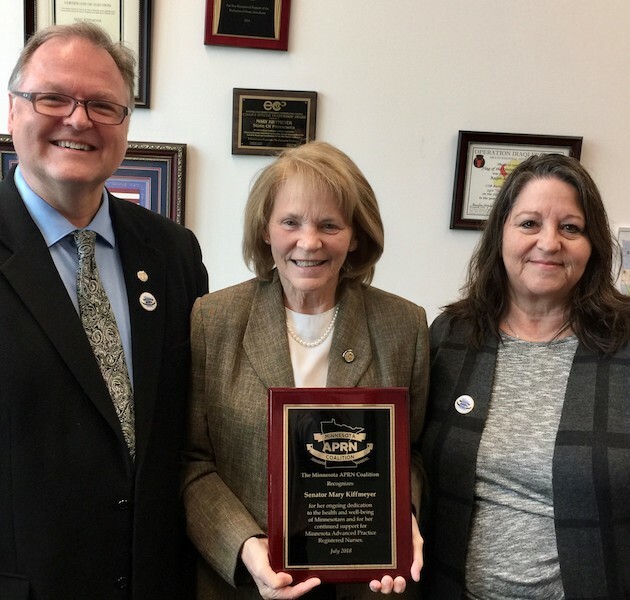 On Wednesday, September 26th the Minnesota APRN Coalition presented Senator Mary Kiffmeyer with an award recognizing Senator Kiffmeyer's tireless and ongoing effort to remove barriers to APRN care. She is a dedicated advocate for MN APRNs and understands the important contributions of APRNs to the health and well-being of all Minnesotans. Senator Kiffmeyer's support for Minnesota APRNs has been instrumental in passing legislation which protects Minnesotan's access to the quality care provided by APRNs. Senator Kiffmeyer has been chief author on several recent bills, most notable is the legislation which allows APRNs to sign death certificates. Senator Kiffmeyer sums up the reason she is so passionate in championing the quality care provided by APRNs in one simple statement "It's all true". Thank you Senator Kiffmeyer! Minnesota APRNs deeply appreciate your efforts and ongoing advocacy!